Lone man moves steadily along the trails of Malibu Canyon State Park clad in the running attire of a marathoner. The only sounds: his feet pounding the peaceful trail and his audible breathing. This man runs eighty miles a week, ten marathons a year, and...is HIV-positive. 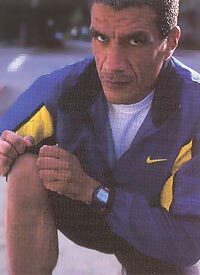 This was Nike's 1995 hallmark commercial featuring runner, Ric Muñoz, the company's only HIV-positive athlete. In 1997, Entertainment Weekly voted this one of the fifty greatest commercials in television history. "The response we received from the commercial was extremely positive, probably one of the most inspirational ads we have ever created," notes Nike spokesperson Scott Reames. "To many, Ric's ad was one of the most pure 'Just Do It' messages we've delivered. Quite frankly, it was not a difficult decision for Nike to create the ad or to sponsor Ric. I wish I could say, though, that we didn't receive any negative comments and that everyone who saw it was inspired, but sadly we did hear from a small number of people who were not happy about it." He adds, "Then again, that's true of just about any ad we do. The ad was not designed to be a social statement or to make any general commentary other than to say that if a runner can get out and conquer marathons while living with HIV, the rest of us can at least get off the couch and jog around the block." The fame engendered by the Nike campaign hasn't changed this forty-three-year-old Mexican-American. Ric lives in a modest apartment, maintains a thirteen-year legal secretary position with an insurance company, and remains healthy, having been HIV-positive for nearyly fifteen years. Ric sits on the edge of a sofa in his living room, dressed in a Nike running suit—sky-blue windbreaker over a white T-shirt with black cotton stretch pants. (Nike supplies Ric with a new outfit and shoes every year.) Seth Eskigian, Ric's six-month love interest, whom he met on the Internet, is conducting business in the next room. Ric admits that this is his first serious relationship and the spark in his eyes denotes that he is smitten. Ric and Seth recently moved together into this little foliage-enveloped haven in West Hollywood. The small living room is furnished with books, DVDs, and a large entertainment center, and is accented with poinsettias and fresh roses. On the coffee table lies a half-finished crossword, which Ric was working on before I arrived to interview him about that other, more serious, challenge in his life: HIV. "I tested positive in 1987, and my well-meaning friends advised me against running marathons," he points out as he stirs his coffee. Ric didn't heed their advice. He had learned to be independent at an early age. He never knew his father, who left Ric's mother before his son's birth in El Paso, Texas. At age six, mother and son moved to Los Angeles's Koreatown. There Ric grew up in a household of silence—his mother never showed him affection and so books became his friends and companions. His first job was at the age of nine, delivering newspapers. Because of his high grades and financial need he received a scholarship to USC, from which he earned a journalism degree. Ric has survived molestation, poverty, bigotry, physical and emotional abuse, and sexual compulsiveness. He always considered life an obstacle course, so what was HIV but another hurdle? And why should he cease running? He found inner peace and comfort in it. Running was a loyal friend. To date, Muñoz has participated in one hundred thirty-four marathons, plus six ultra marathons (a distance that is over the usual twenty-six miles). In 1998, he won his first marathon, The Christmas Marathon, in Olympia, Washington. His winning time was two hours, fifty-three minutes, twenty seconds. Ric has also run marathons in Canada, England, Italy, and South Africa. This athlete still runs fifty miles a week through the streets of Los Angeles, and plans on participating in ten marathons in 2002! Presumably, such a strenuous exercise regimen could tax an already impaired immune system. On the contrary, recent studies indicate that strenuous exercise may actually enhance the immune system in quantifiable ways. A UCLA study has shown that moderate to heavy exercise can substantially improve immune indices in HIVers. The Copenhagen Muscle Research Center investigated the capability of strenuous exercise to induce elevated plasma concentrations of chemokines. High concentrations of chemokines have been shown to protect against the progession of HIV disease toward death. The blood of eight runners in the 1997 Copenhagen Marathon was sampled before the run, immediately after the run, and every thirty minutes during a four-hour recovery period. Chemokine concentrations peaked thirty minutes after the run, increasing 6.7-fold, 3.5-fold, and 4.1-fold after each successive thirty-minute period. "Further investigation is certainly necessary," according to Dr. Michael Scolaro, a Los Angeles-based physician with a large HIV practice, "but it is important to remember that anyone who is considering competing in a marathon should have a thorough consultation with his or her doctor to rule out any cardiac, pulmonary, or skeletal muscle conditions." 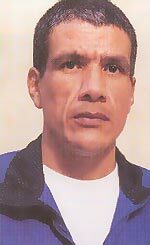 After Muñoz received his positive test results he began taking AZT, switched to ddl, and then in 1994, he decided to take a holiday from the drugs because he felt uncomfortable with ddl because it was closely related to AZT. "I had a very bad reaction to AZT and wanted nothing further to do with it once my doctor told me to discontinue using it. My doctor also had to strongly campaign for ddl and after much agonizing I finally opted to take it from early 1992 until mid-1994. My body reacted a lot better to ddl than it did to AZT, but I was still leery of it. More importantly, I was still in what I felt was robust health. Combined with the excellent results I was enjoying from my marathon races, I was left feeling that by taking a break from all antivirals, it would give my body a respite from the side effects of the ddl." Ric was off meds for two and half years, but eventually contracted cryptosporidiosis, a severe form of diarrhea. "Had I still taken that stand of, 'No, I don't want to take the drugs,' it would have ended very badly. I was down to fifty-two T cells, and the viral load was at four hundred thousand." Ric began cocktail therapy and the crypto diminished in two days. He continues to take them to this day. "In retrospect, my doctor agrees with me that when it did come around to my resuming treatment in February 1997, my body not only responded well, but the threat of my body not responding well was greatly reduced due to the fact that it was not harmed by the side effects of the ddl. Therefore, it made my body—at least to my mind—stronger and better able to resume the rigors of the antiviral therapy. "These drugs are phenomenal in the sense that they not only keep so many alive," he stops a moment and clarifies, "I didn't really understand the drug therapy at first, and had no idea that after I began the cocktails that my T cells would elevate so quickly. They are nearly 800 now." He is pleased. By the time the protease inhibitors were in full force, Ric's doctor had discussed them at length with him and assured him at that time (the summer of 1997) that they offered the most optimistic promise. "My doctor frst had me on the NNRTI regimen for eight or so months and I benefited from that regimen. My immune system responded in a revitalized way—my viral load became undetectable. However, by late 1997, my doctor became concerned by the return of the viral load. One thousand or so copies showed up in my blood work. That was enough for him to adjust my existing nevirapine/d4T/ddc regimen so as to incorporate the saquinavir/ritonavir. I've been on that five-drug regimen ever since." He briefly fumbles with his pencil. "Interestingly, none of the side effects from the PIs have alarmed me nearly as much as the side effects of the AZT and ddl did back in the mid-'90s. They are quite manageable. I have regulated my increased cholesterol level by taking megadoses of niacin and have thus avoided having to take any of the prescription cholesterol drugs such as Lipitor, etc. I've also avoided, for the most part, the side effect that causes one's face to become more gaunt-looking. Until my current regimen begins to not be effective, I assume I'll continue on it untl the doctor tells me it's time to move on to something else." What does Muñoz think about the future of the meds? "Once people begin to show signs of resistance, there needs to be an array of replacements. The researchers keep hunting for alternatives to the protease inhibitors. And each year choices seem to increase. We need to keep looking for drugs that are easier on people's systems." For the record, Ric adheres to conventional antiviral treatment and does not use any alternative therapies, nor does he take vitamins. He doesn't feel closed-minded about alternative remedies; it's just that his existing regimen is working so well that he doesn't feel the need to incorporate anytihng else, at least for now. Like many of us, Ric has lost friends to AIDS and, in 1989, he lost his only relative, his mother, to cancer. Muñoz deals with their deaths, or any adversity for that matter, by remaining anchored in reality. He philosophizes about the inevitable: "I think about death a lot but not in a fearful way, and I do believe in an afterlife. I must believe in an afterlife because I often say I believe in one!" Ric is expressive and uses his hands continuously to illuminate a point. He is affable, though it takes him a second or two to get to the matter at hand. Once there, he is forthright and determined. Muñoz's main concern these days is the vulnerability of the youth populatoin to the threat of HIV. He maintains that AIDS prevention campaigns should focus on them. "The message we need to be sending to them is that if they let their guard down that that is one of the quickest ways to become infected. But if you're not even aware of the fact that you have to have some sort of guard, then we will go back to the way we were. And that really scares me," he says with his hands cupped between his knees like a kid. "The young people feel they are invincible and they won't get HIV. If they get HIV, they will be in the same boat I'm in right now and all of us who are infected. Their whole lives will be so compromised that who knows if they'll have the emotional strength to deal with it," he pleads. "When I and my contemporaries were faced with HIV we saw plenty of us who managed to carry on because we had that built-in maturity. We were people in our thirties and forties. And we had a fighting attitude. But to ask a teen or early twenties person to really restructure their whole lives, that's tough." Ric edges back into the sofa a bit and continues: "My advice to them is to not kid themselves into thinking that HIV is going to pass them by. You will not be spared. It's so easy to get infected. They need to know this. He takes a sip of coffee and briefly gazes out the window onto a typically sunny December day. His face is flushed with thoughts as he emphasizes, "Taking the meds is a whole process that requires vigilance, and they do cause side effects. You're not taking vitamins or an aspirin, so you can't screw around with the dosages either. It's a whole reprogramming." What propels Muñoz to stay with the regimen is the painful memory of his bout with crypto. "Though my doctor and I have tossed around the idea of my taking a supervised break from the regimen—due to the fact that my numbers have come back so impressively during the course of my four visits to him in 2001 (once every twelve weeks)—we both have agreed that, for now, it would be best to continue as I have, primarily because my body has responded so well to the combination." What would Ric say to someone who has just been diagnosed with HIV? "I would tell them to just draw on their experiences, to look at their inner strengths, and to begin taking the meds as soon as possible. Even if you are good at dealing with problems on your own I'd advise to embrace your family if you are close to them. Don't shut them out. If you keep the secret it will only add more stress, which your system doesn't need. Get your battle team in place. Support groups and therapy are fine but you can't get those everyday. You need to find support. If there is absence of family, then get your network of friends together. You will need their comfort," he says. "To go it alone is just too daunting. I managed to do it but that was by choice. I didn't get upset when I found out I was HIV-positive. For me it was a freak thing. I lucked out." Suddenly, as if passing a co-marathoner, Ric sprints to the topic of money and conveys alarm over the decrease in fundraising. "Without the funds, there will be no prevention campaigns to warn these kids. And if the money is not there the social service agencies that provide outreach and treatment will just dry up." Horror veils his face. Seth enters the room, and heads to the kitchen to pour some herbal tea. A moment later, Seth returns. I ask him, "Can you provide some insight into the Roadrunner?" He ponders for a moment and then the information gushes. "Well, his world does not only revolve around running, although he is a sports fanatic. Our second bedroom is lined from wall to wall with books, and he's read most of them. Ric is one of the smartest people I know. He's just a 'knowledge junkie!'" he chuckles. "Ric is always trying to improve himself and this is what I admire about him the most. Beyond being 'Mister Smarty Pants' he has an incredible sense of humor and loves people. He really is a people-person, and I'm just glad that I was the person he chose to be with!" Seth departs, and Rick elaborates on thier bond. In 2001, Muñoz ran fewer marathons to take more time to build his relationship with Seth. This union is merely another challenge–a very familiar word to Muñoz. From hardship beginnings to HIV, he has triumphed and is an inspiration. "Ric has been a great HIV role model," says fellow HIV-positive marathoner Steve Dunn. "His candor has been hugely educational to the public and his spirit has lit a kindly competitive spirit in his fellow HIV-positive runners." Ric Muñoz certainly has gone the distance.